You guys! We made it! Friday! That means its time for some wonderful recipes! 2- Cream together the sugars, salt, butter, and peanut butter in a stand mixer. 3- Beat the egg and vanilla into the sugar mixture. 4- Beat in the flour and baking soda. 5- Form dough into one inch balls. Bake 6-7 minutes, or until the edges are lightly golden, on a lined cookie sheet. Cool completely, then store in an airtight container. Preheat oven to 400°. Season chicken with salt and pepper. Lightly spray a grill pan with oil or grill outside on a gas grill. Cook chicken on the grill until no longer pink, careful not to overcook or you'll have dry chicken. Meanwhile, heat a sauté pan on medium heat. Add oil and garlic, sauté a few seconds, add spinach, salt and pepper. Cook a few minutes until heated through. When chicken is done, lay on a baking sheet lined with foil or parchment for easy clean-up. 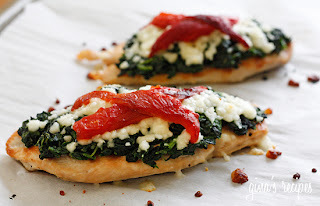 Divide spinach evenly between the 6 pieces and place on top. Top each with half oz mozzarella, then slices of roasted pepper and bake until melted, about 6-8 minutes. Immerse the peaches in boiling water for 30 seconds, then place them in cold water. Peel the peaches and slice them into thick wedges and place them into a large bowl. Add the orange zest, 1/4 cup granulated sugar, 1/2 cup brown sugar, and 2 tablespoons of flour. Toss well. Gently mix in the raspberries. Allow the mixture to sit for 5 minutes. If there is a lot of liquid, add 1 more tablespoon of flour. Pour the peaches into the baking dish and gently smooth the top. Combine 1 1/2 cups flour, 1 cup granulated sugar, 1/2 cup brown sugar, salt, oatmeal, and the cold, diced butter in the bowl of an electric mixer fitted with a paddle attachment. Mix on low speed until the butter is pea-sized and the mixture is crumbly. Sprinkle evenly on top of the peaches and raspberries. Bake for 1 hour, until the top is browned and crisp and the juices are bubbly. Serve immediately, or store in the refrigerator and reheat in a preheated 350 degree F oven for 20 to 30 minutes, until warm. Yummyyyyyy!!!!! What is it with all you girls posting these fab recipes?!!!! :) Makes me so hungry! And I cant stop eating!!! I will have to share with you a recipe that I have! Mexican. Yummy. Yum! All these recipes sound absolutely delicious. I think I will definitely have to do some cooking this weekend. Thanks for sharing! 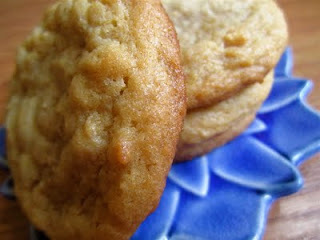 Peanut butter cookies are one of my fave treats!